Near the end of February we showed you a preview of the Deck Cydia tweak. 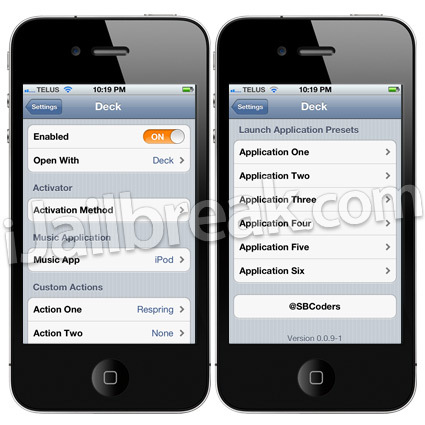 What the Deck Cydia tweak essentially does is adds a sidebar to your iPhone, iPod Touch or iPad that can be brought up by an Activator command of your choice. In this sidebar lays actions/shortcuts that can be configured from the Settings.app that allow you to, for example, access frequently used applications or toggle system settings. The Deck Cydia tweak is quickly growing to be one of my favourite Cydia tweaks as it provides extremely useful functionality with a native iOS feel. 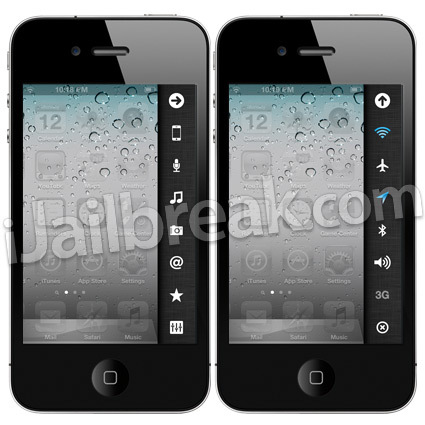 It is also a very customizable Cydia tweak! From the Deck settings section present in the Settings.app you can configure numerous things such as what is your default Music.app (iPod, Pandora or Spotify), up to 6 Custom Actions and frequently used applications, and so much more. Cant use it some reason, I chosen activation method but nothing happens. On 5.0.1, unable to get it to activate either. 5.0.1 iPad2: Cant use it. I have tried several activator methods, but nothing happens. Whats wrong? download it from an iphone with lower than 5.1 with your account, than you could go to your phone and have the choice to download it as well, everything works but the only shortcut s not working for me is the iPod or Music…I’m on 5.1 and I first purchased it from my girls phone which is on 5.0.1 with my account…..It is a great tweak, definetly the number one for the week…..
Great app, can someone tell me what is THEME used on preview pictures. If it doesn’t work all you have to do is Disable it in Deck’s Settings and then Enable it again. Should work fine after that.